What makes it addictive? You’ve probably played games that seem all similar and you’ve probably found them to be very addictive. But Happy ELMS is not your typical “stick man throws spear” game. It offers a lot of variety and challenges that keep you playing for hours. The beautiful design is the cherry on top. What is Happy ELMS & how to play it? 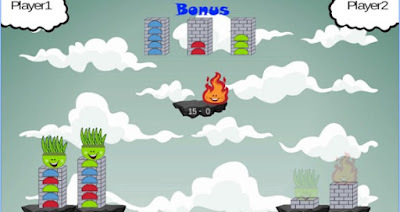 This game is very addicting and fun to play – you have three characters Freddy (fire), who beats Garry (grass). Garry beats Wally (water). Wally beats Freddy. They are standing on a tower and you send one of them to beat your opponent and get as higher scores as you can. The characters you win go to your tower and if you’re at tie, the tied ones go to the bonus filler where you get bonus for each 5th character. If you lose your last character, your tower gets destroyed leaving you with only one tower. If you lose that one too – the game is over. The best thing about this game is that is highly addictive and fun. There are even instructions on how to play it! With amazing graphics and engaging sounds, this game will get you hooked in no time. Share your scores on Facebook or Twitter and play with your friends!